Come see me at Anime Expo…sorta! So I’m trying something a little different for Anime Expo … my stuff will be there, but I won’t! 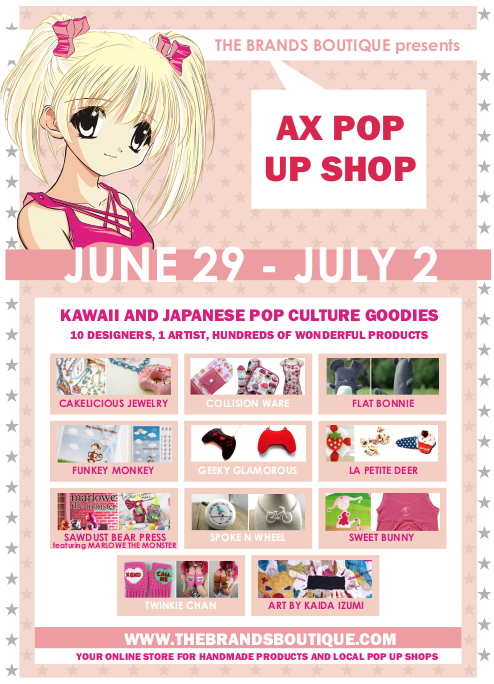 The Brands Boutique asked if I’d like to participate in their Pop Up Shop for Anime Expo, and I figured I’d give it a try! It’s at the Los Angeles Convention Center from June 29- July 2. If you happen to go, please take pics and show me! I’d love to see how it all looks! I sent a nice variety of items, even the new rocket pop brooches! I also printed out a new little table-top sign, so I hope everything turns out cute :). 2 Responses to Come see me at Anime Expo…sorta! I am so curious about how it will all turn out!! !